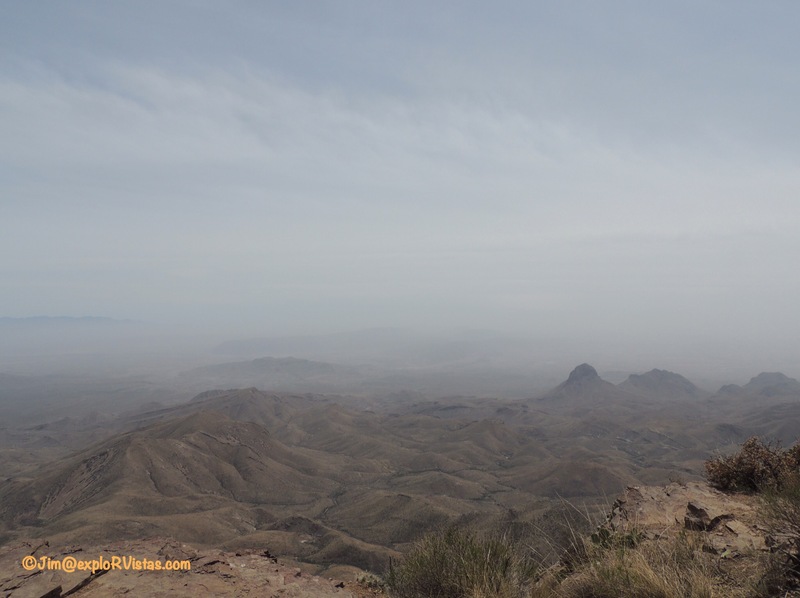 Most of Big Bend National Park is dotted with various mountains, mesas and buttes, primarily covered with desert vegetation. 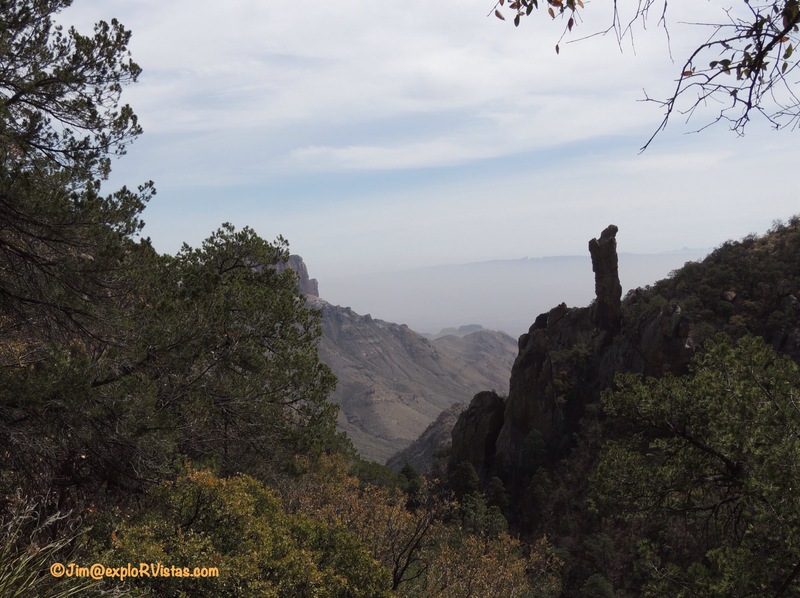 The exception to that is the Chisos Mountains. 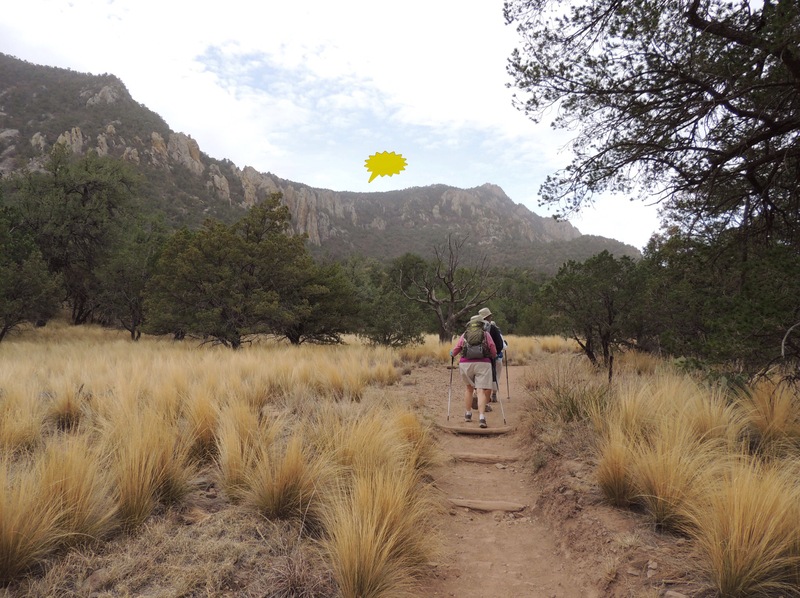 It is here that the plants of the outlying Chihuahuan Desert share space with pines and hardwoods usually associated with places much farther north. 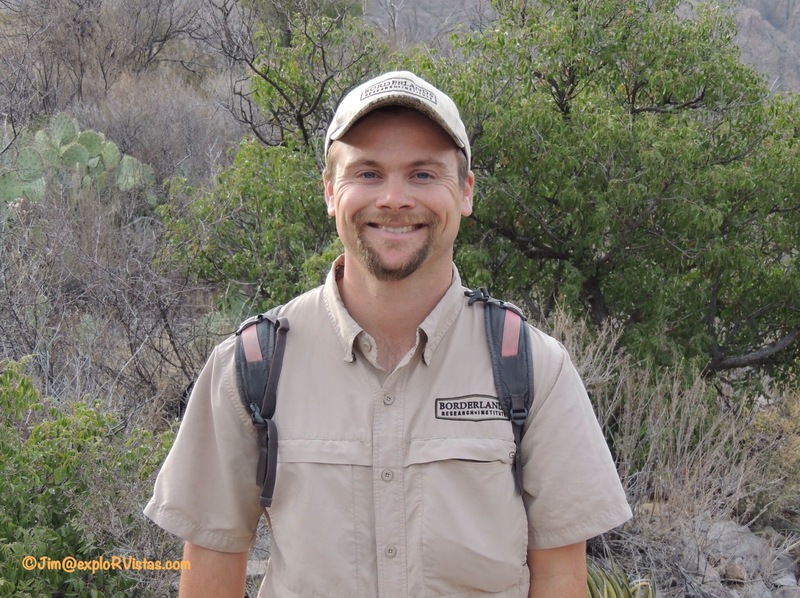 Animals such as black bears, mountain lions, and javelinas can be found in the hillsides. Temperatures are often much cooler than the neighboring landscape. And the hiking trails are scenic and challenging! To paint a picture of this stand of mountains, it is actually the remnants of an ancient volcano. 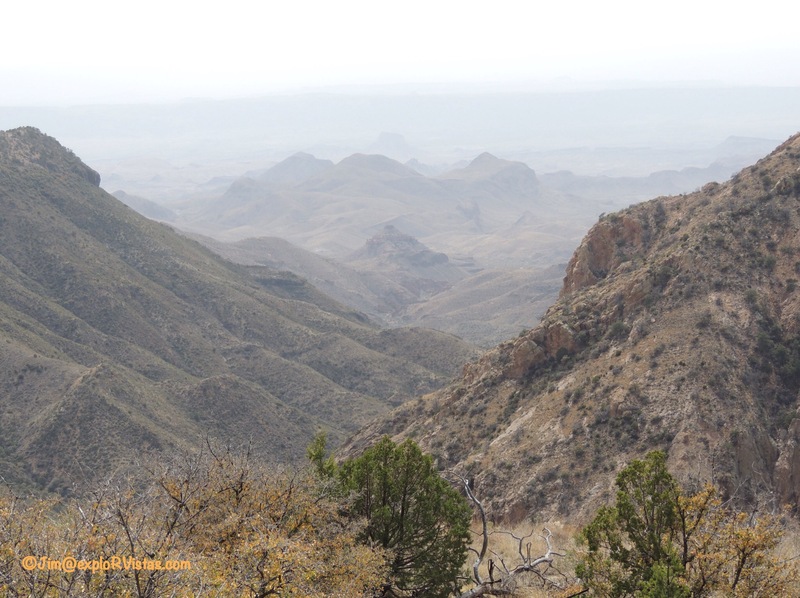 The Chisos Basin is the collapsed caldera of that volcano, and that is where the lodge, campground, and visitors center are. 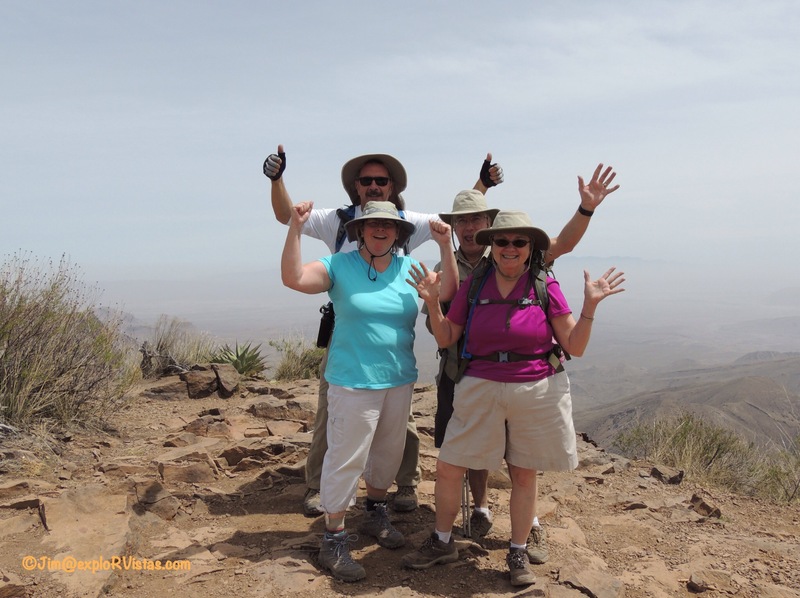 Most of the mountain hikes originate from the basin and go up into the mountainsides around it. Our first mountain hike actually stayed in the basin. This was the Windows View trail, and it is paved and ADA compliant. At one third of a mile, it is more of a stroll than a hike. This trail loops to the northwest of the lodge, providing an outstanding view of the V-shaped pouroff through the mountains referred to as The Window. Appropriately named, this geological feature offers a stunning vista of the desert floor outside of the mountains. Depending on the time of year, it can also act as a frame for a spectacular sunset photo! There is also a trail which runs directly to the brink of the pouroff (don’t get too close, as it is a 250 foot drop!) We did not have time to explore it this trip, but we would consider it in the future. Our second hike in the mountains was the Lost Mine Trail. 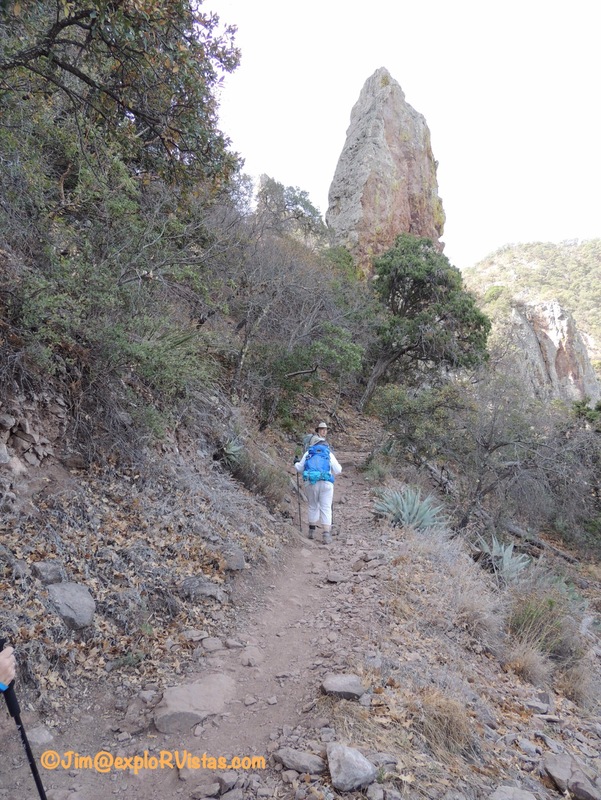 This 4.7 mile round trip trail is rated as difficult, and has an 1122 foot altitude gain. It begins a little ways up the basin road from the lodge at the foot of Casa Grande, seen in this photo. Here is Diana, ready to head up the trail! The trail had numbered viewpoints, but there were no booklets at the beginning of the trail. I had read that getting to #10 was a ‘must’, and here is the view from that point. The mountains in the distance are in northern Mexico. A fellow hiker was kind enough to snap a photo of us at that viewpoint. 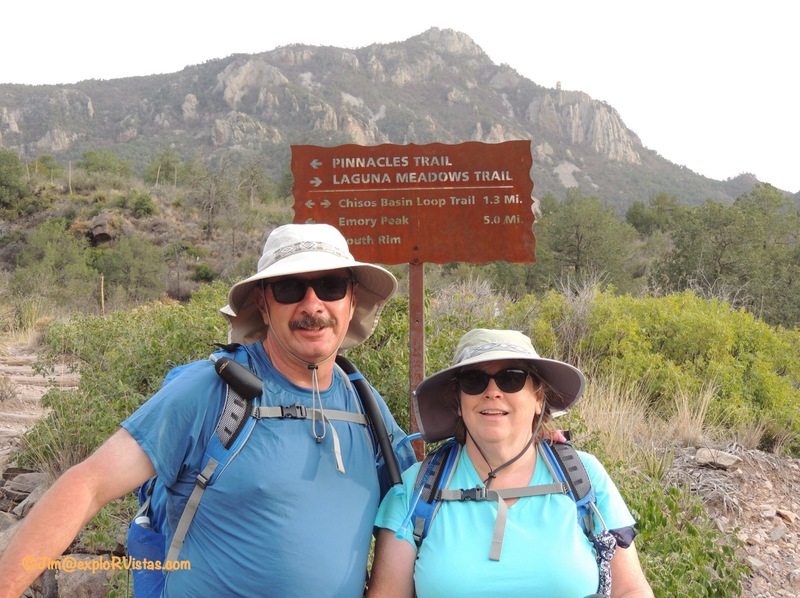 On Wednesday, April 6, we joined Nancy and David on an all day hike to the South Rim. This was the primary reason we came to Big Bend, and has been the focus of our winter’s worth of training. 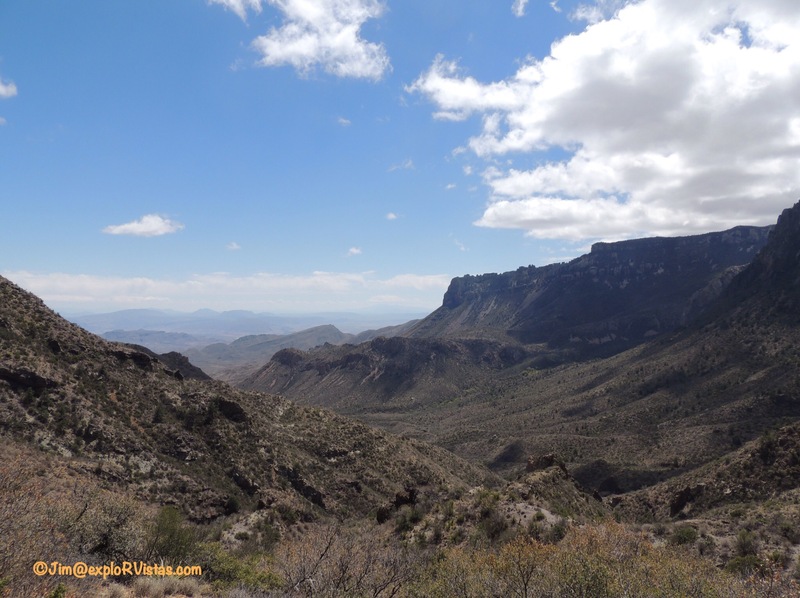 This hike is a 12 mile loop with a 2395 foot altitude gain and is rated as strenuous. I’ll tell you what, y’all…they ain’t kiddin’. 🙂 While this would be right up some of our fellow bloggers’ alleys, this was quite the challenge for us! 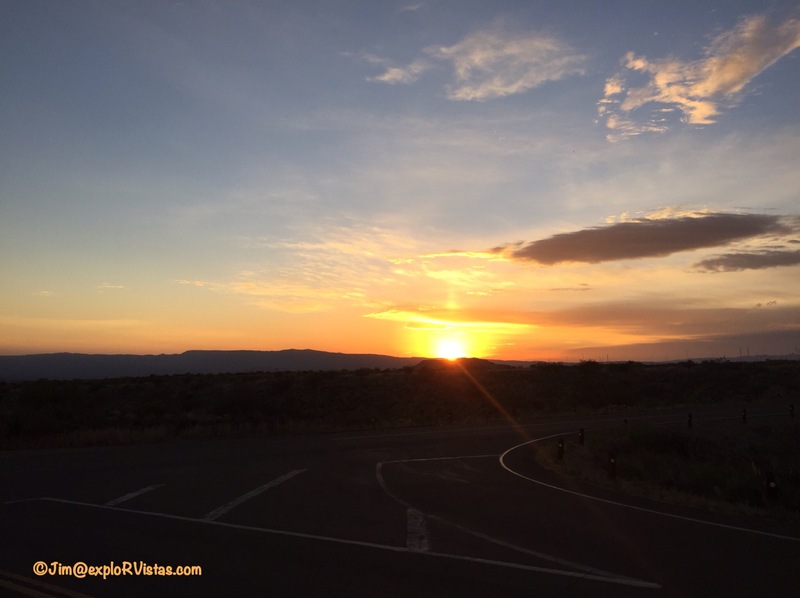 We started out driving to the basin from our campsite in Study Butte before dawn. This beautiful sunrise greeted us on our way east. 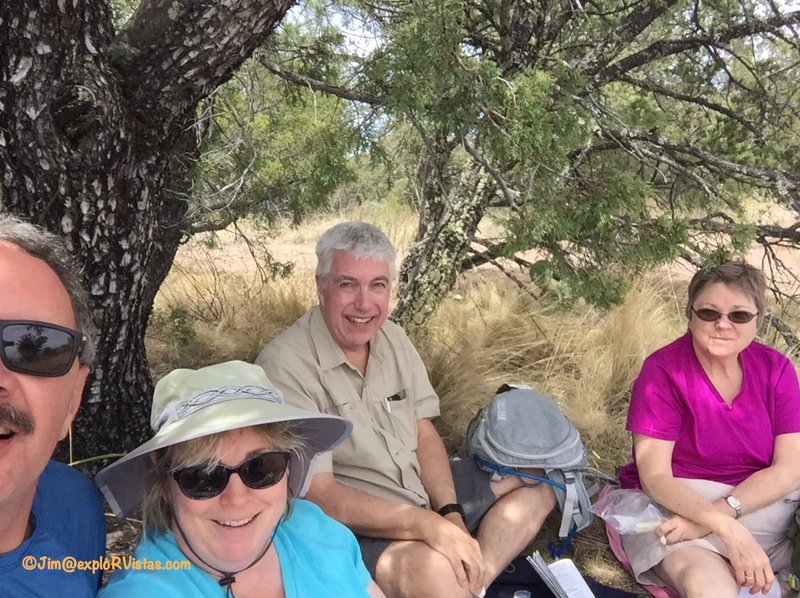 At the trailhead, I made a feeble attempt at a four person selfie. Let’s get hiking! The pointer shows our first obstacle: the Pinnacles. A good portion of our elevation gain occurred getting to the top of that ridge. Switchbacks were the order of the day, along with some fairly high steps. These jagged rocks were typical of the surface we walked on throughout the day. 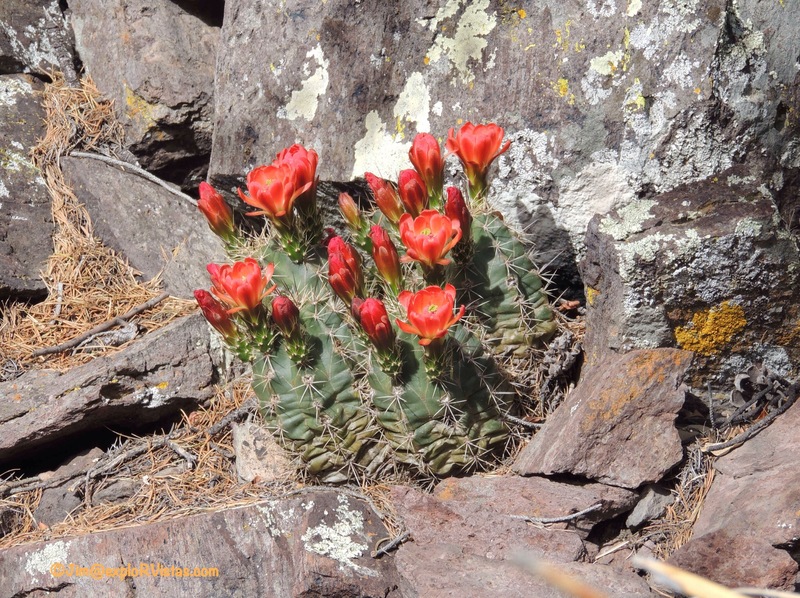 We saw several Claret Cup cactus blooming along the path. Further up, we stepped aside to let this worker pass on his horse. 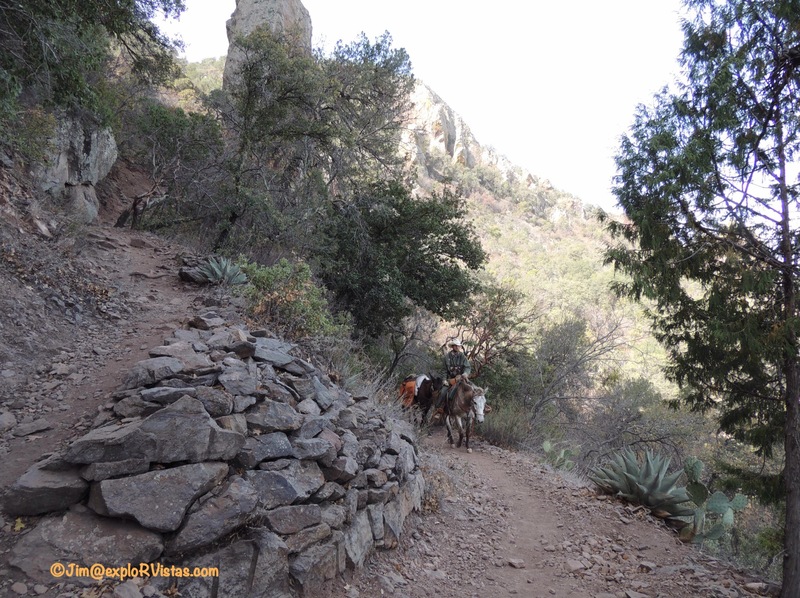 His trailing mule was hauling supplies to trail workers farther up in the mountains. Finally, we made it to the top of the Pinnacles. Here is a view back down into the basin. We started down by the buildings near the cone in the center. 3.5 miles under our belts at this point. This Gray Breasted Jay greeted us at the top. It didn’t show much fear, as I was just a few feet away from it. 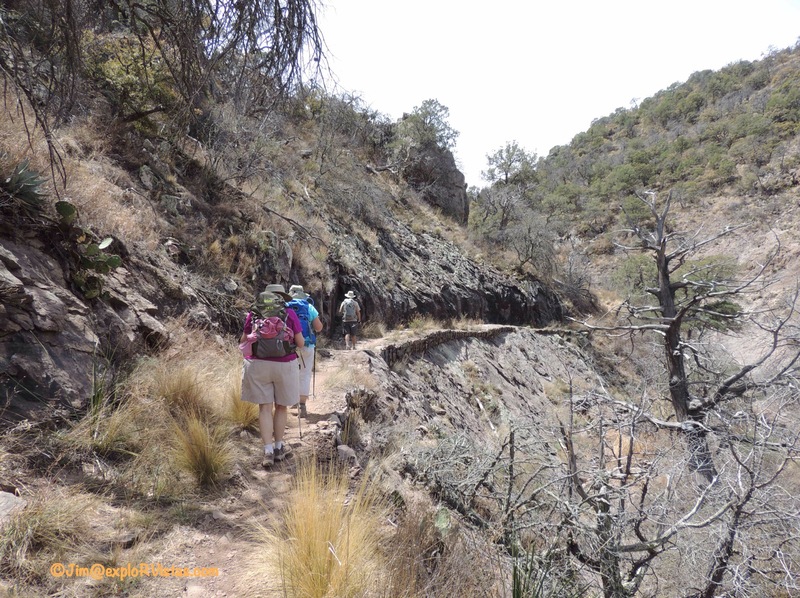 We continued along the Boot Canyon trail for 2.8 miles towards the South Rim. As we were hiking, we met Ian. 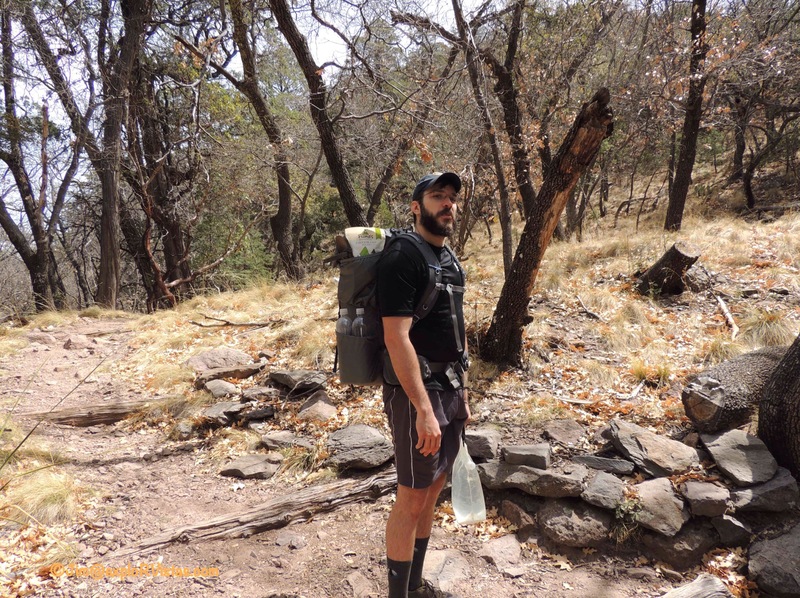 He is practicing for an attempt at completing the entire Pacific Crest Trail this summer. He was heading into the mountains here for three days with his pack and a total of 9 liters of water. Really nice young man. We wish him well! 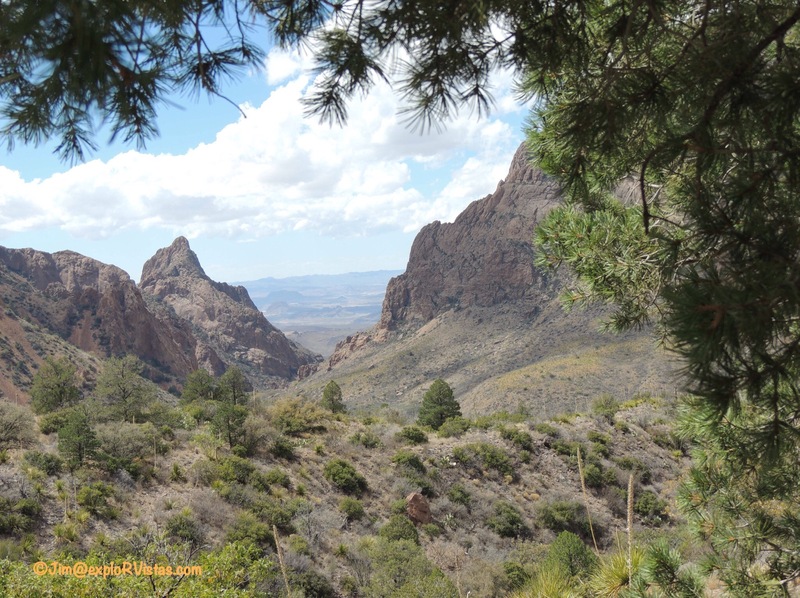 As we hiked, the spire that gave Boot Canyon it’s name came into view. The pathway hugged the edge of the canyon most of the way. Finally, we could sense that the South Rim was about to come into view. Even with the haze, we could see a long way! We found a shady spot and settled in for lunch. After lunch, we headed west along the rim. 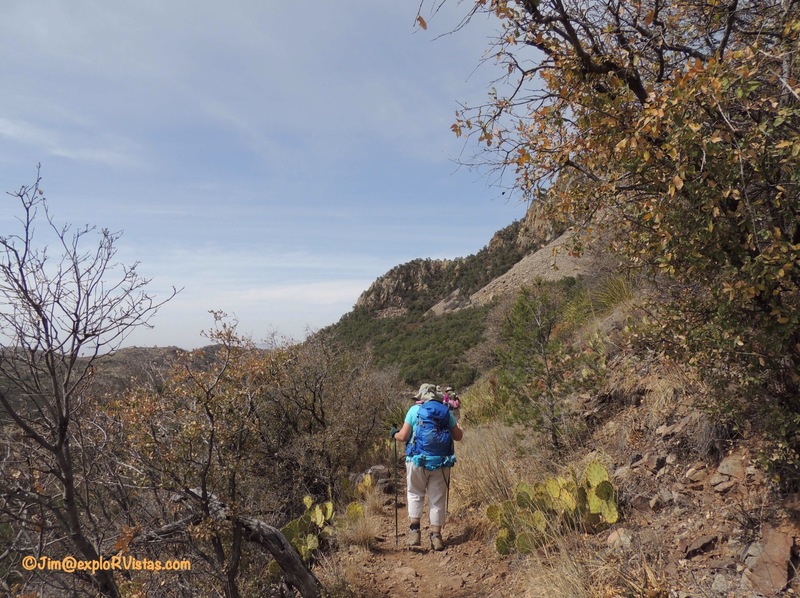 The trail eventually turns to the north, continuing along the outer edge of the Chisos Mountains. By this point, we were starting to feel the effects of those sharp rocks. The western slope is gentler than the Pinnacles/Boot Canyon route. The South Rim trail eventually meets up with the Laguna Meadows trail. 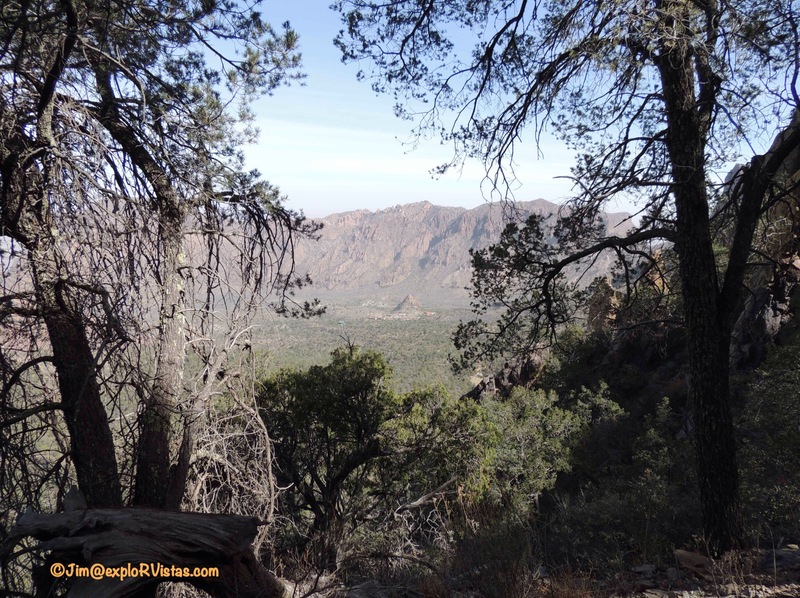 This is a gorgeous valley running back towards the Chisos Basin. On a clear day, these views would be breathtaking. Not long after we were on the Laguna Meadows trail, the basin came into view. That was deceiving. We continued walking and met a young man walking UP the trail… which was surprising, as it was getting late. We made it to our starting point! We definitely learned a lot on this hike, and we are very glad we did it. 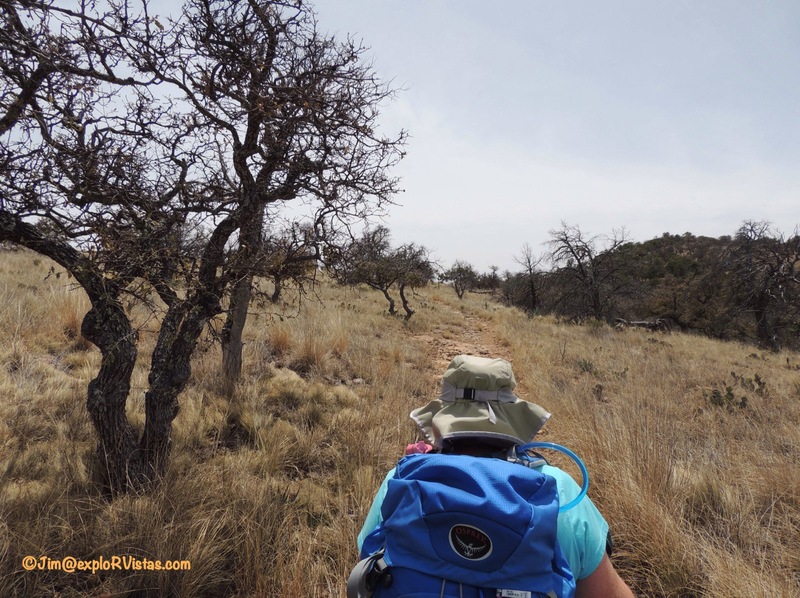 12 miles, while possible for us, is longer than we prefer….especially with elevation gain and loss. By the end of the hike, our feet were begging us to get off the trail…which somewhat defeats the purpose of being out there to enjoy each other and nature. We carried a gallon of water with us, as recommended by the park service, and we used just about every drop. We will be able to gauge our water needs on future hikes, as a result. If anyone were to ask our opinion about doing this hike, we would recommend breaking it into two days and staying a night near the rim in a tent…taking into account that it would require carrying more gear and water. There are several campsites available that you can reserve. Being miles from any artificial light, the stars would be fantastic. 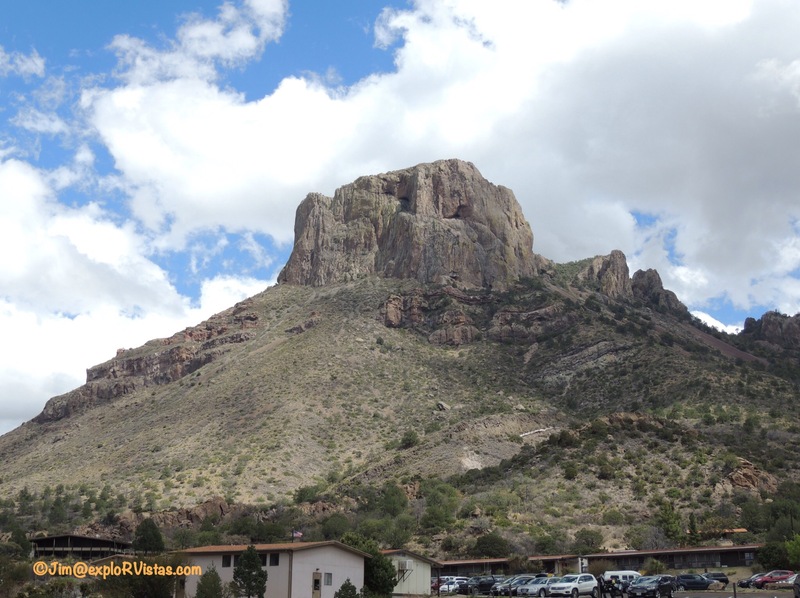 That wraps up our mountain experience at Big Bend. Next up: the Rio Grande River! Search and shop our exploRVistas Amazon link HERE. The hike looked great. We are planning to be in Big Bend next March. I would love to know the amount of time the hike took you from start to finish. Also would love to know if there are any dog friendly places to hike in the area. I guess the answer to that is that it totally depends upon your hiking ability. We are recreational hikers, and we completed it in the daylight hours, if that helps. 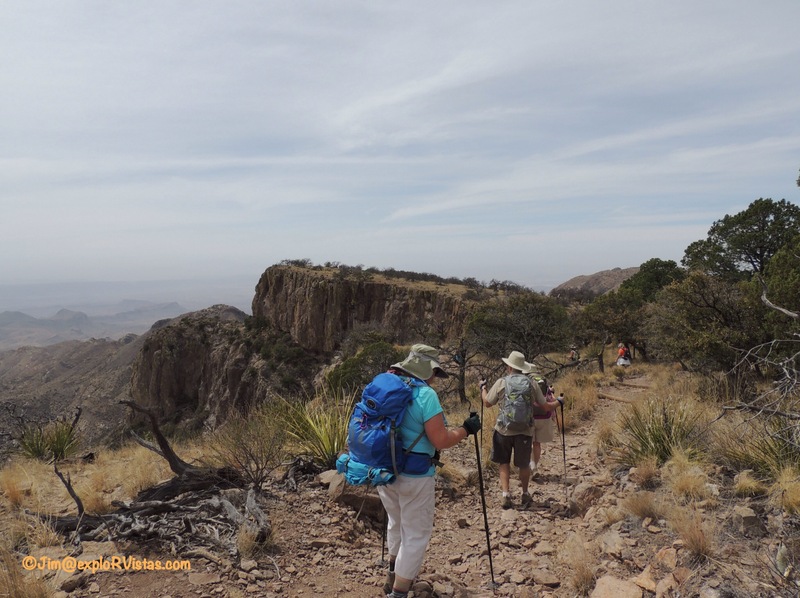 As far as dogs, we would recommend not hiking with them at Big Bend, due to the wildlife, jagged rocks and the heat. We have had three Golden Retrievers over the years, so we do have experience in doggie hiking. I would even read up on the lion attacks on small children before I would take kids on the trails. With that said, definitely go see this beautiful place, as it is worth the precautions! Looks like some great hikes in that area! The mountain lion is one animal that has eluded us so far. We have seen bear, bobcats, lynx, I think I might even have spotted a sasquatch, but no mountain lions yet! We’ve seen a mountain lion from our vehicle in Hoh rainforest, but no yeti yet! 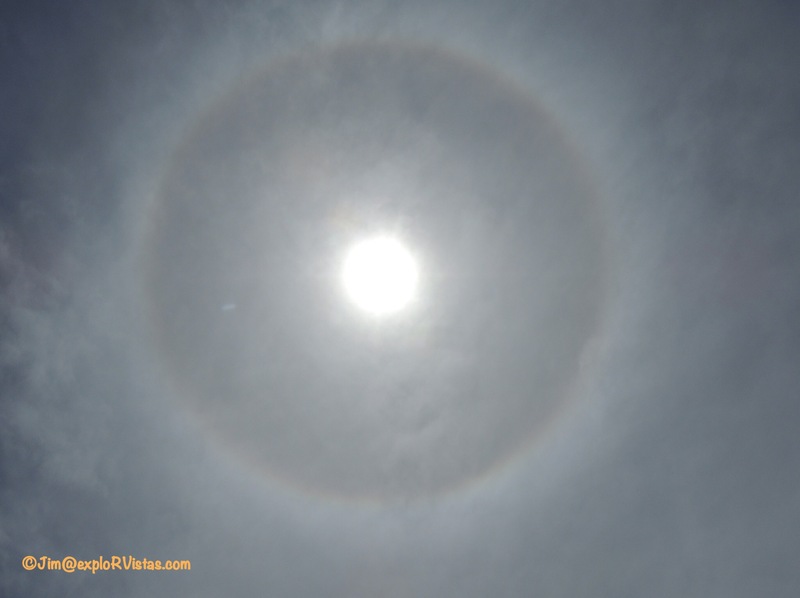 Beautiful pics and “cheers” to another informative post. Have I told you lately that I love love love reading your blog!!!! Congratulations on completing the 12+ mile hike !!!!! 🎊🎉🎊 Diana, you deserve the golden hiking stick reward for making that trek while nursing plantar fasciitis! Ouch! We backpacked along the South Rim of the Chisos a few years ago and saw the most fabulous sunsets and sunrises. While we were there a mountain lion visited the next campsite along the rim from us, we never saw a thing. Have fun! Wow! I’ll bet the stars were beautiful at night! I’m glad you guys had great hikes — those distances are more than my leg will tolerate so I really enjoyed the images. The whole topic of human/animal interaction in the parks is getting to be more and more of an issue. I’m not sure the issue would be quite so bad if some of the humans acted more responsibly — seeing as the critters are only doing what they know to do and generally don’t want to mess with us two-legged critters. I’d like to think that education would help but I wonder some times. Great job on this hike:) A 12 mile hike is long for anyone, especially with a climb. Good that the climb was early on:) Now that the days are longer a 12 mile hike can be done easily with time for photos and just stopping to enjoy the view. It is about the journey after all. I am sure you had a good night’s sleep:) Well done! Thanks, Pam! You and John are an inspiration to us all! Great job on the hike and great views and pics were your reward! 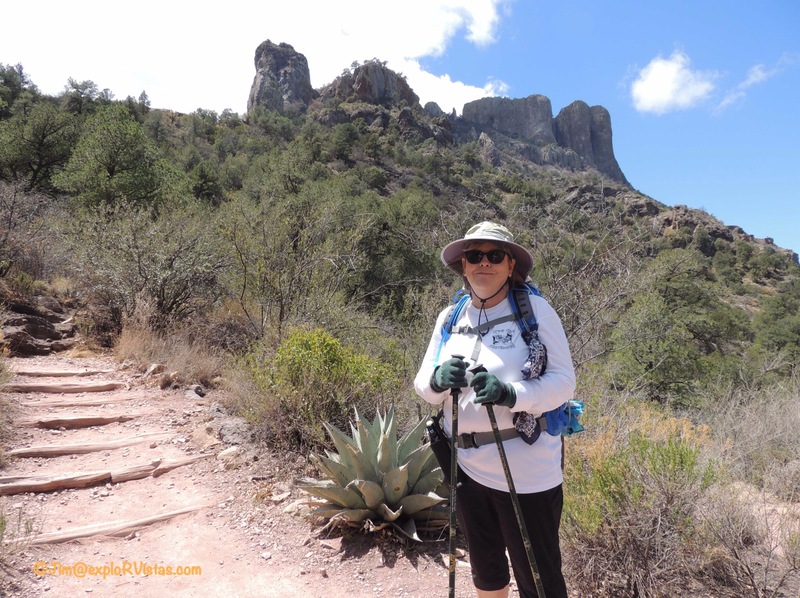 12 miles is LONG – especially with the elevation change! Not sure my knees are up for a hike like that yet – but hopefully soon! Thanks Kelly! That definitely WAS long. 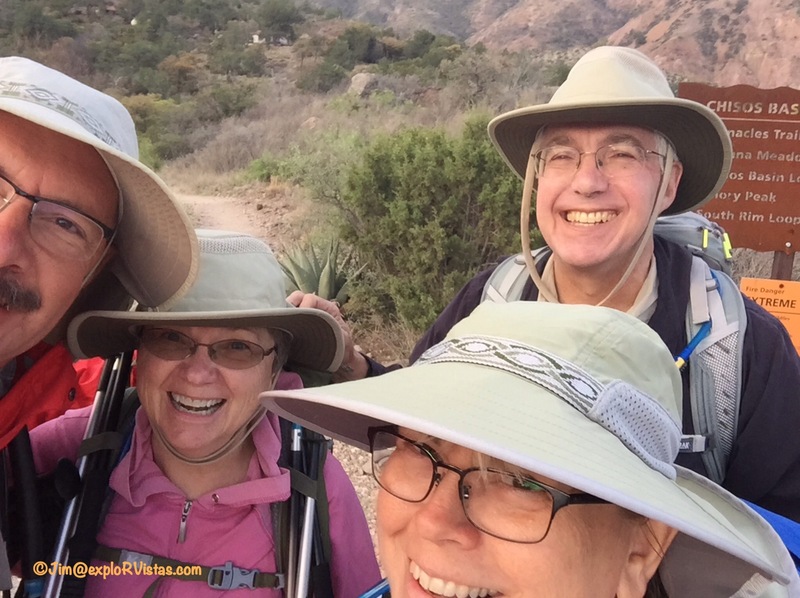 🙂 Any length hike is a good hike, as long as you are having fun! I’m with Kelly. I got tired just reading about hiking that far. LOL. Though one can dream… right? Every trek begins witht the first step and it should be baby steps at that, till you get the hang of imitating mountain goats or lions etc. Cindi and I have done a 5 mile hike around a lake near Wisconsin Dells a few years back. Waaaaay back when, I did all day hikes in the Rockies… I’m not as agile as I was back then. As you say any hike you do and enjoy, is a good one. So true, Brian! We trained at sea level in Florida this winter, and the only elevation gain was over the Melbourne causeway. :). Big Bend was in the 5 to 7000 foot range, and I actually caught a quick bout of altitude dizziness at the top of the Pinnacles. We sat down for a bit and it passed fairly quickly. The Boot Canyon trail went down for a bit, which helped. What a fantastic accomplishment!! So impressed by you guys !! Thanks, Trace! Looking forward to your upcoming posts on your travels to Alaska! Congrats on such a challenging hike! What a bonus to have pretty flowers and interesting people to meet. 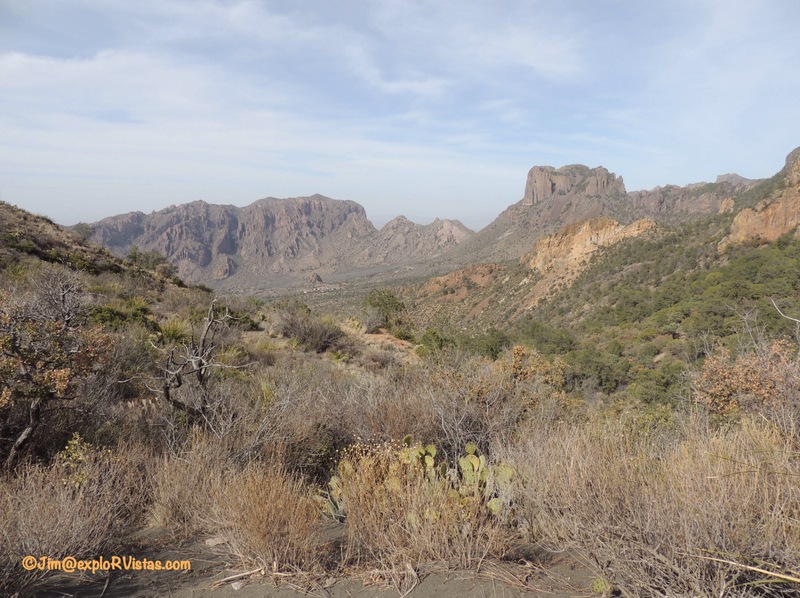 Big Bend is certainly diverse!! It certainly is, Jodee! Thanks for the congrats! 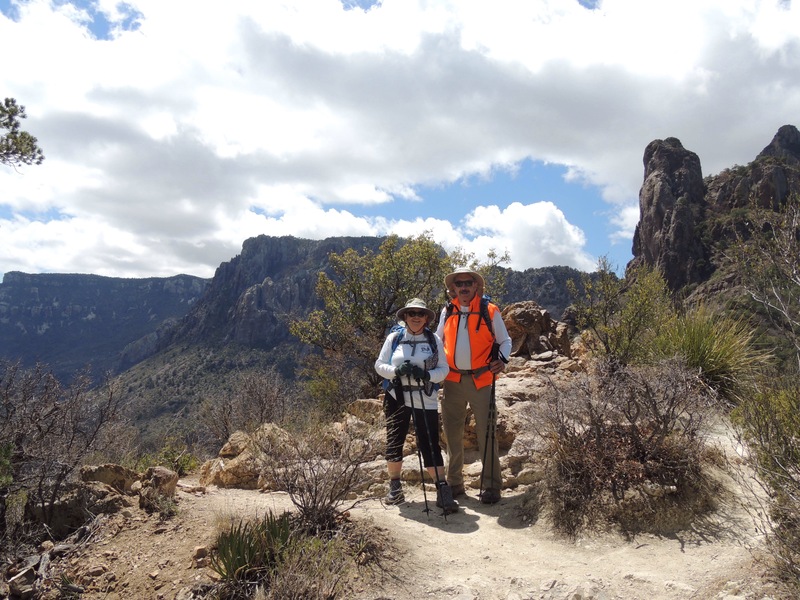 We were in Big Bend from March 31 to April 3, perhaps we said hello on the trail! 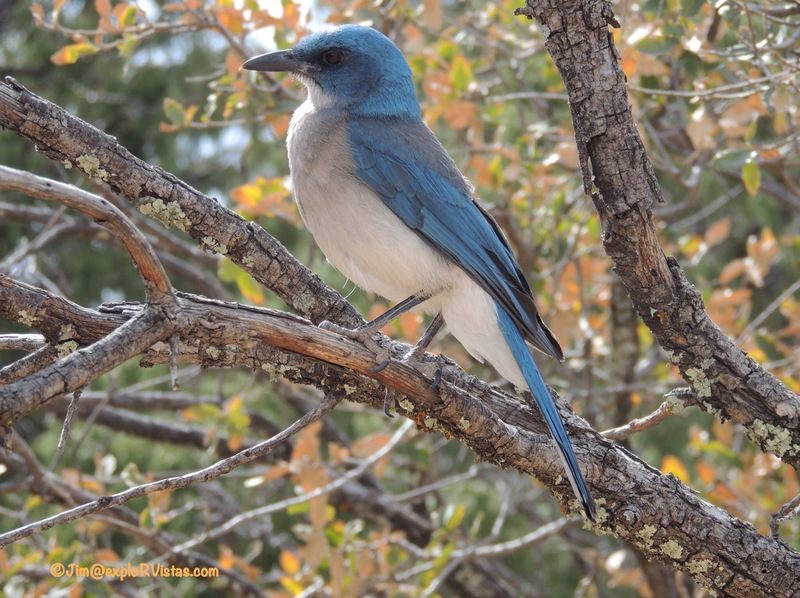 It far surpassed my expectations–rivaling Capitol Reef as my favorite park. 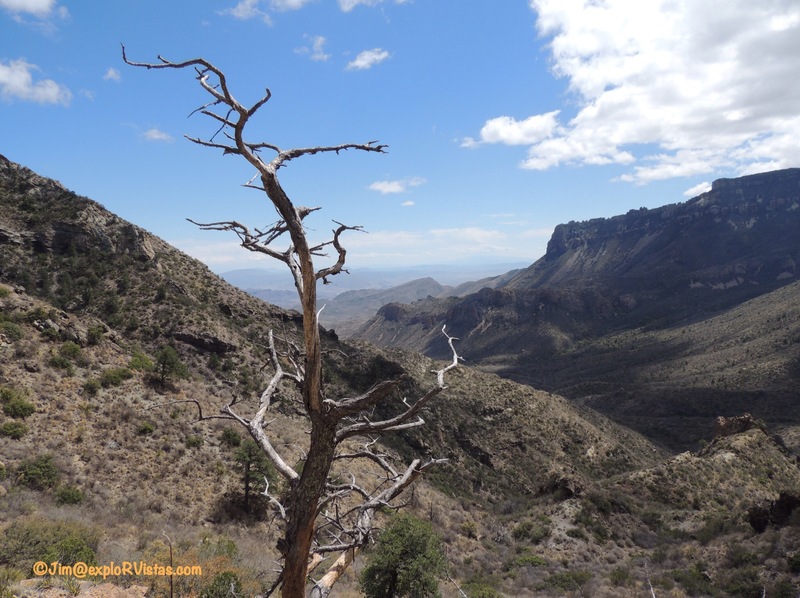 We did Lost Mine Trail on our first day of hiking — loved the views — and the South Rim loop on our third day of hiking. We did it in the opposite direction as you which meant a less steep (although still strenuous) ascent. The South Rim loop might just be one of my favorite hikes ever — so many ecosystems in one hike and the desert in bloom too! I was in heaven. We also did Closed Canyon on our fourth and final day of hiking — spend the day in the state park. We brought rope so the guys went down the 15 foot or whatever drop, but the next one was longer, so they stopped there. My sis-in-law and I stopped at the 15-footer — we’re not so foolhardy or strong. I can’t wait to return to the Big Bend area one day when we’re living in an RV. It’s just a dream right now but one I want to make happen in the next few years. I’m a writer, so portable, but my honey owns a business, so that’s complicated. I love following your blog and others — my inspiration to work harder (except when I’m taking a break like right now) and save more. Thank you!